Rogue Chocolatier is the newest American bean to bar chocolate maker. Located in Minneapolis, Minnesota, this efficiency apartment sized chocolate factory was started just a few months ago by Colin Gasko. Aside from the fact that he has created what is most likely the world's smallest chocolate factory, there are a few things you should know about Colin. He is 22 years old, he doesnt own a car, he does a lot of the work himself, he has not yet been to a cacao plantation and he makes fantastic chocolate. 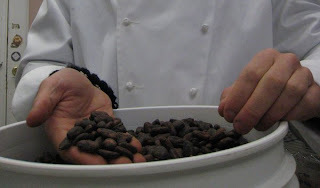 A bean to bar chocolate manufacturer means a maker who does everything from the raw bean, starting with cacao beans that have been fermentedand dried by the grower, but not yet roasted. So the beans are takenall the way from this raw state to a molded bar of chocolate by thesame maker. The process begins with sorting, then roasting, thenwinnowing and cracking, then grinding, then mixing, then conching. Andthen there is tempering, molding, cooling, and wrapping. Colin does nothave employees, and much of this is his one man show. He is helped outby his father four days a week, and a friend pitches in ten hours aweek. Colin often relies on friends for transportation. Therearent many bean to bar makers in the world, some 50 or so at lastverified count. About 20 are in the United States. When I say verified,it is because bean to bar has become a desirable label denoting anartisan maker, and so many chocolate companies seek to elevate theirstatus by claiming to make their chocolate bean to bar, but they are what else fudging the truth! 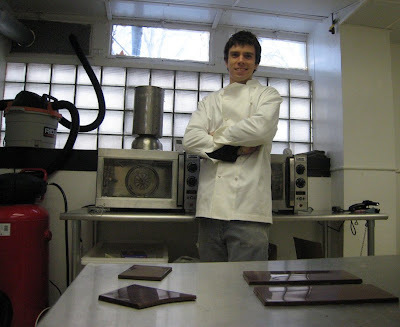 Sowithout a car, Colin gets rides, takes the bus, or rides his bike tohis Southeast Minneapolis warehouse space each day, which happens to beright next door to nationally known Twin Cities chocolatier B.T.McElrath, and there he usually spends 14 hour days perfecting hischocolate. This manufacturing operation is all in one openspace, with one small storage alcove in the back, where Colin storeshis beans in 5 gallon plastic pails there is no room for large sacks of beans. As we progress along thetour, he says things like I use this as my cooling room, as he makesa sweeping motion to the wall in another part of the space, just acouple feet away from the conching room we are standing in, which isthe middle of the room. This funky metal rack is the room where thebars cool inside their molds resting on shelves. There are maybe 50bars in the cooling room today. And some 100 more against another wallawait their packaging in their very own wrapping room. Much of the equipment has been custom built to a scale fitting the digs. The batch size at the time of my tour is small 30 lbs. A new conche is being built and is slated to arrive next month, and this will increase batch capacity to 200 lbs. Colinprefers a shorter conching period of about 18 hours. He conches toabout 20 microns. The chocolate is currently aged one month. He prefersto age for two months, and says this will become possible when thebatch size increases with the new conche. With increasing demand due toa recent article in the local weekly City Pages, and such small batches, it has been difficult to let the chocolate sit a full two months as of yet. Thefirst time Colin got the idea to go into business as a chocolate makerwas one year ago, only six months after the first time he had made hisown chocolate at home. He had been making truffles for awhile and foundthat to be limiting and an already crowded field, and so decided toembark on a little home made experiment, and his first bars were madeusing equipment from Chocolate Alchemy, aone stop shop for the home chocolate maker and the same way others havegotten their start. Like many other small batch artisan makers, Colinis teaching himself the trade by reading old manuals, consulting withother artisan makers, and by the experience of trial and error. Colinhas eaten a lot of chocolate since he was a boy. When the tides ofchocolate making in this country began to gently turn toward a moreartisan approach, he took notice and became an early fan of ScharffenBerger when their first bars came out in the early 2000s. 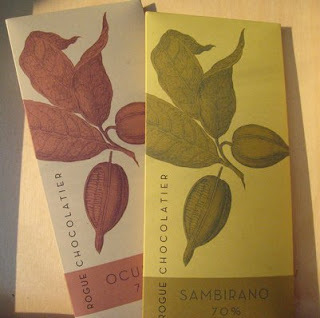 CurrentlyRogue offers a Sambirano and an Ocumare, both at 70%. The next originson the docket are Trinidad, Dominican Republic, and Jamaica. I had achance to sample the Trinidad, Im a big fan of this origin, andcommented to Colin that what I liked best about his take on thisinteresting bean was the way he handled the coconut, differently thanTrinidad bars Ive had by other makers (namely Pralus and Amadei.) Andwith a smile he proudly told me that it was a trick he had pulled tobalance the coconut and fruit, and this was the reaction he was goingfor. I also had the chance to sample some raw, unroasted cacaobeans (below) for the first time, they were from Jamaica. I found themmuch less bitter than I had anticipated, and with a sweetness I did notexpect still evidence of the sweet cacao pulp before some of its delicate flavor is roasted away. I really enjoyed it. Colinoffered me a sample of the Ocumare, then the Sambirano, and he wasanxious to hear my response to his work, and kept pressing me for morefeedback than simply good. I told him that he would have to read therest on the blog. I told him I need to give this the full treatment,with the fresh palate in the morning, and he said la Chlo! Yesexactly, I replied, la Chlo! Chlo is Chlo Doutre-Roussel,whose name is inevitably encountered early on in the world of finechocolate. Her famous little pink book, the introductory manual Chocolate Connoisseur,is familiar reading to most of fine chocolates initiated. More aboutChlo and her book later on the Chocolate Note. For now lets say sheis notorious for her six a.m. chocolate tastings, conducted with afresh palate no eating first! Colintold me that he had just recently received an email from Chlo, whoheard about Rogue from the City Pages article, and is already on thescene offering guidance, asking questions, without even having tastedRogue chocolate. She has been encouraging him to stop using vanilla,which many in the new artisan movement are tending to omit. Colin doesnot use soy lecithin, also becoming more common practice among artisanmakers, and he uses nondeoderized cocoa butter. He would like to takeChlos advice and experiment with no vanilla, and also with no addedcocoa butter down the road. He would like to play with otherpercentages, but at this time his plans are to unveil the Jamaica,Trinidad, and Dominican Republic as 70% bars, sometime later this year.He is also working on a blend using some of the above origins plusArriba, and this will likely be a limited edition run. Colinlooks forward to these and other experiments and admits he has a lot tolearn, and that his palate is still developing. When asked if he wouldhave a presence on the chocolate salon circuit next fall, he said hemay not be ready. He really wants the chocolate to be as close toperfectly where he wants it to be as possible, even if he thinks it isnot too far off now. For the time being he is content to work withsolid bars no flavored bars, no milk chocolate, no bonbons. He is happy to explainthat since he only processes cacao, sugar, and vanilla in his workshop,his products are currently 100% vegan, gluten, nut, and dairy sensitivefriendly! And what chocolate bars other than his own is he happyto eat? I like the Theo Ghana, thats a good one for that nice cocoa-ykick. And I liked Scharffen Bergers last Cuyagua, once it settled alittle bit, for a couple months. And he can't say enough good thingsabout Steve DeVries and his chocolate. Steve has served as a source of inspiration and guidance to many of the newer artisan chocolate makers. Andso, as promised, I have conducted my morning tastings and present myconclusions below. Colin himself is not so into these rituals aroundtasting times of day, palate cleansing, special methods No, he says I just put it in my mouth and chew. For his first twoefforts, I will say Bravissimo! As to the new chocolate, I look forwardto having new Rogue chocolate to put into my mouth and chew! Wherecan you get Rogue chocolate? Outside of a few Twin Cities retaillocations, currently limited to the Kitchen Window, Surdyk's andKopplin's Coffee, it is currently only available through Rogue Chocolatier. And once you've ordered online the rest is simple, you know what to do put it in your mouth and chew! An Ocumare to get your motor running. The champagne explosion is balanced by an appropriate amount of coffee and bitter notes. Don'tlet the fact that my flavor notes are the shortest fool you, the tasteis is the most amazing part. The finish has an aromatic herb bouquetthat is best described as sprucey. More often than with any otherchocolate I have so far tasted, I had the feeling that there weredistinct flavors and aromas which I should be able to recognize, butwas not able to quite name. "What's that, oh, wait, what's that?" Forthe aftertaste, at first I thought, "This finish is not so stellar asthe aroma and taste had led me to expect," but every time Ithought,"Okay, that's it," it kept coming back, if subtly, with wavesof the most pleasant chocolate, overlapped at turns by nectar,marshmallow, craisin, and rose. So that by the time it really was done, my taste buds, like a child just finished with a ride at the fair, said "Let's go back and do it again!" Casey: Thanks for pointing out about the COPIA Festival - it's on The Chocolate Life Events Calendar. For everyone who's going, I will be leading the keynote, giving a tasting, and signing books. Good luck with your entry! I would like to commend Colin for really going for it! Its like reading about a rising singer/ songwriter who crafts his own lyrics/ music/ and plays multiple instruments- putting it all together and creating a masterpeice album- Im sure we will be hearing about Rogue much more in the coming months & years...Im heading to the website to buy some now! Casey, what a great idea! I gotta try these, I can't resist tasting new chocolate! Look at that snap and sheen! Great photo.Woo hoo, I'm going to Minneapolis in June! Going to be putting things in my mouth and chewing, I expect. Casey:Really love the attention to detail and thoughtfulness on this. I haven't tasted it, so please encourage Colin to join so I can ask him to send samples so I can review them. This is cross posted from my blog as Clay suggested.